Joint restrictions can have huge negative consequences for athletic performance so make sure none of these affect you. In exercise and sports science, achieving triple extension has been the goal of many common athletic movements. Triple extension is a position in which the ankle, knee, and hip are extended. 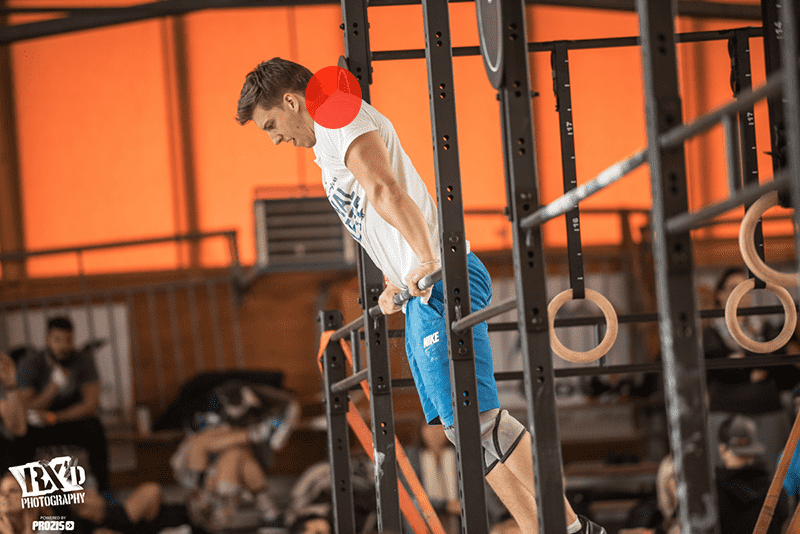 In CrossFit programming, there is revolution in the way coaches and trainers look at movement. Most CrossFit exercises and workouts emphasize what I call global quadruple extension. This means the athlete extends the foot/ankle, knee, hip, and the thoracic spine. The inability to get to this position results in poor performance and pain. The following is a list of joints that I find are routinely restricted and prevent athletes from moving efficiently into this globally extended position. Keep in mind that dysfunction at one joint leads to dysfunction throughout the entire body. Lack of extension in the big toe prevents our foot from creating an arch when our heel hits the ground. This is referred to as the windlass mechanism. As the heel strikes the ground during gait, our foot rolls into pronation (collapse of the arch). The contact of our toe with the ground slows pronation and pulls on the plantar fascia to form the arch of the foot. The inability to slow pronation leads the athlete to overpronation, or pushing off almost completely from the big and second toes. This forces compensation from other joints to slow the knee as weight is transferred. WHAT IMPACT WILL THIS HAVE ON PERFORMANCE? 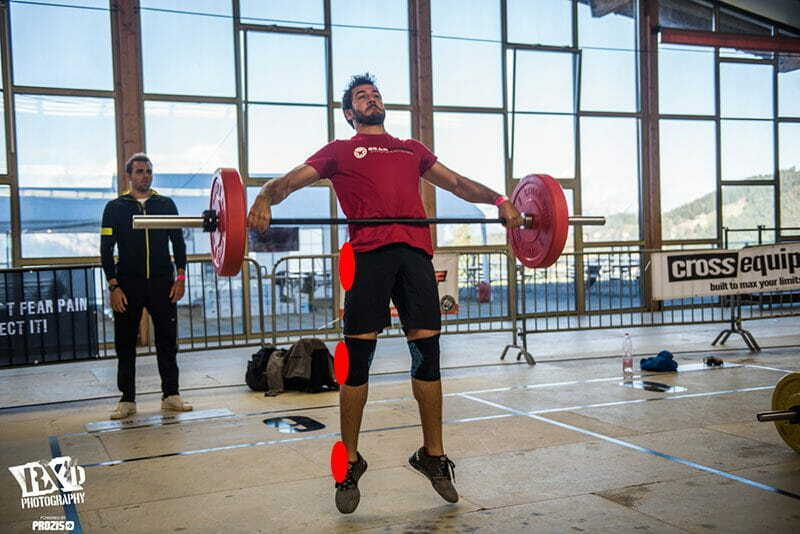 Many CrossFit workouts have exercises that involve transferring weight from one leg to the other (i.e. running, lunging, farmer’s walks, etc.) These exercises are examples of locomotive movements for which the goal is going from point A to B. To be efficient, an athlete should perform this movement in a straight line. Think of traveling: You want to take the shortest direction to get to your destination. Taking the scenic route usually costs more in gas and time. Running is no different. An athlete who overpronates pulls their knee closer to the their midline. This means they must constantly compensate with other muscles to prevent their knee from collapsing inward. The end result is likely pain and definitely a waste of calories and increased fatigue from using muscles improperly. Types of pain an athlete will feel: A person who overpronates will often complain of plantar fasciitis, Achilles tendinitis, and hip bursitis. At the ankle, if we find a talus bone that has shifted laterally, then this is an indication we are carrying more of our weight toward the midline of our body. The ankle accommodates this shift in weight distribution by turning the feet outward. In doing so, the Achilles tendon gets twisted around a bit and movement becomes compensated. 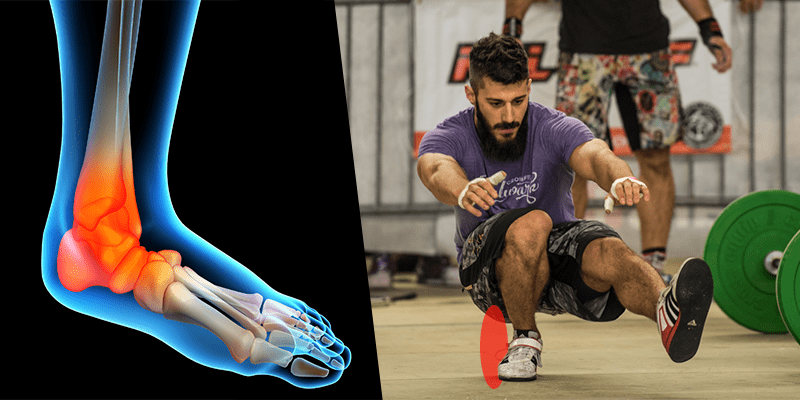 Dorsiflexion (the turning of the toes up and bending the foot back toward the ankle) is lost and our brain will ask other muscles to pick up the slack, thus creating a compensation pattern. When the ankle doesn’t bend well, the knee and hip will try to make up the difference. A restriction at the ankle joint will force the knee to travel forward and ask the quadriceps to carry the burden of slowing the knee down. This puts the glutes in a poor position to load up and limits the amount of force that can be produced. For an athlete who is exploding out of the hole during a barbell squat, this is detrimental to force production. Our ability to create power from our gluteus maximus hinges largely on our ability to extend our hips backward as we descend into a squat. Lacking dorsiflexion pulls our knees and drags our hips with it. Types of pain an athlete will feel: An athlete who suffers from a lack of dorsiflexion will often complain of shin splints, knee pain, and low back pain. A lot of people don’t understand the pelvis isn’t just one piece. Although, at first glance it may appear as one cylinder, it really is made up of four pieces: a right and left innominate (hip), the sacrum and the pubis symphysis. With that being said, one hip should be able to flex while the other extends. One of the most common postural deviations that occur is an anterior pelvic tilt. This is when one or both innominate bones tilts forward. This position will lock the back of the pelvis in place and prevent it from extending the hip. 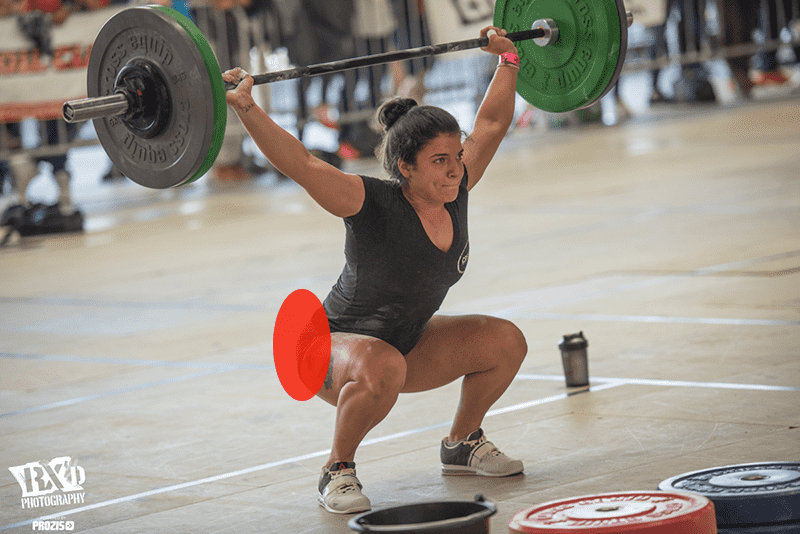 WHAT IMPACT DOES POOR HIP MOVEMENT HAVE ON PERFORMANCE? Without the proper ability to flex and extend at the hip, an athlete will be forced to compensate their movements when doing things like running. The hip is very dynamic and can perform many different movements. Flexion of the hip comes with external rotation, while extension of the hip is coupled with internal rotation. A person who lacks the ability to extend to an anterior pelvic tilt will also lack the ability to internally rotate well. This will drive the brain to compensate by moving the leg forward, which usually means the leg must be swung forward from the side. As a result, the athlete will shift a lot when they run. Again, energy is wasted and performance suffers. 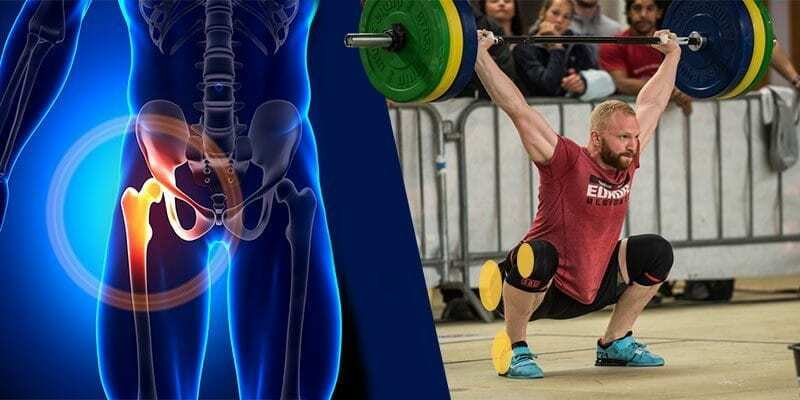 Types of pain an athlete will feel: An athlete who has an anterior pelvic tilt will often complain of pain in the sacroiliac (SI) joints, quadratus lumborum (QL) muscle, and knees. Excessive thoracic kyphosis (rounding of the shoulders) may have the biggest observable negative impact on global extension. Our scapula (shoulder blades) is attached to our rib cage. When an upper back rounds, our shoulder blades get pushed up and forward. This closes down the space that the upper arm has to roll around in the socket and makes it impossible to get the arms overhead without manipulating the position of the spine. Excessive rounding also changes the position of the rib cage, because it is normally accompanied by an excessive arch in the lower back. In doing so, the ability to properly recruit the trunk muscles is inhibited. WHAT IMPACT DOES THIS HAVE ON PERFORMANCE? 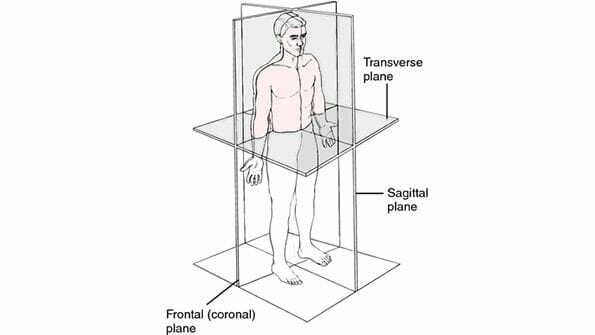 Many CrossFit exercises are performed in the sagittal plane (a vertical plane that passes from anterior to posterior, dividing the body into right and left halves). From the shoulder, there are many exercises that involve flexion and extension of the shoulder. The shoulder is pretty dynamic and can move in out of multiple planes, but it really depends on the positioning of the scapula to do it efficiently. When the scapula is too high, you will need to compensate by arching at your lower back to get you arms over your head. 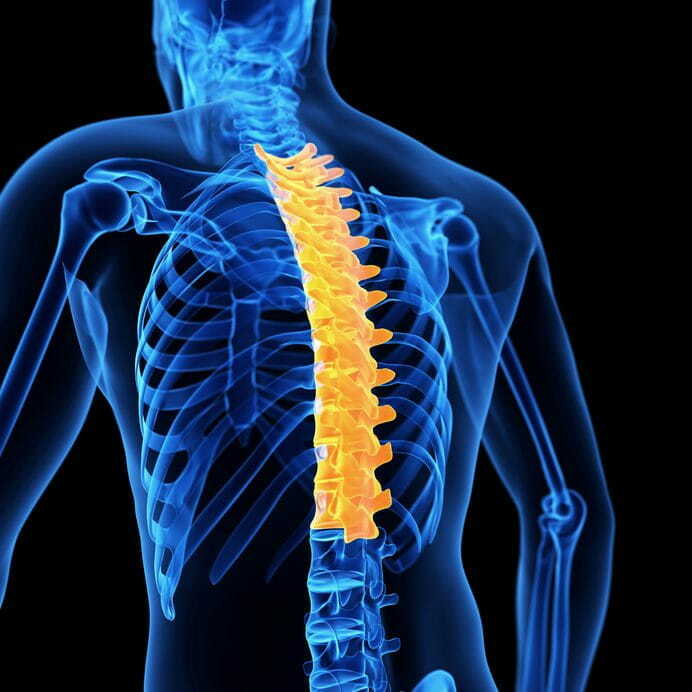 Again, this is an example of an energy leak, in which the goal is to get weight overhead; but to do so, the entire spine must be deviated. The more kyphotic a person is, the more lordotic (bigger the arch in the low back) the lumbar spine usually will be. In addition, when a person has an excessive curve in their thoracic vertebrae, they will also lose rotational mobility. 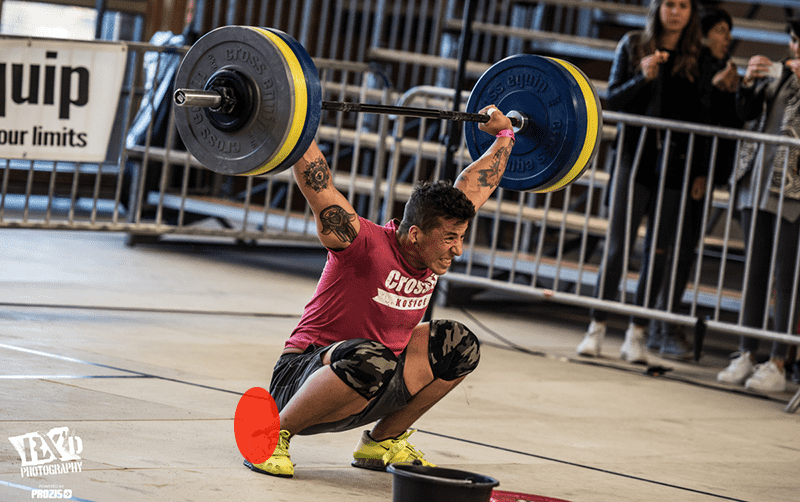 Considering how much rotational power is needed for running and rope climbing, this spells doom for CrossFitters looking to crush multi-modal PRs. Types of pain an athlete will feel: An athlete who has an excessive thoracic curve will often complain of shoulder impingement, tennis elbow, and mid-back pains. A forward head carriage is the most common postural deviation seen at the head and neck. The head weighs 8 to 11 pounds. We need to remember that the spine is one piece. If the neck is out of position, the rest of the body either follows it or is taxed excessively to hold it in place. One of the muscles over-worked by a forward head carriage is the levator scapula. A short and overactive levator will pull up and forward on the scapula and make movement of the shoulder dysfunctional. The sport of CrossFit is incredibly dynamic and requires explosiveness, coordination, flexibility, and stamina. Often overlooked is the importance of maintaining a center of mass. Having a forward carriage displaces this center of mass to a forward position. Almost as if a person is constantly falling, the athlete’s brain will need to recruit additional muscle to maintain alignment and good positioning. This is counter-productive for an athlete who is trying to be faster, stronger, and go longer because muscle gets trained to do a job. A muscle that is easily stimulated can be recruited when it is not needed. This is the concept of synergistic dominance and reciprocal inhibition. Poor alignment for an athlete leads to muscle imbalances and movement impairments. A forward head carriage is an example of this. If we go back to our functional anatomy, we know the levator scapula muscle attaches from the base of the skull to the top of the scapula. A forward head carriage will shorten the levator scapula and the upper trapezius. Proper shoulder function and rib cage positioning will be very difficult to achieve because the lower trapezius will be inhibited and the scapula will be hard to depress. Types of pain an athlete will feel: A forward head carriage is associated with shoulder impingement, neck pains, and headaches. In most parts of life becoming great has very little to do with doing more of what you already excel at and everything to do with the little parts we try and hide. Crossfit has revolutionized the capacity the human body is capable of. Our “engines” are stronger, faster, and fitter than ever before in any time throughout history. The only thing will slow us down is failure to take care of our smallest parts.